The Nigerian government led by President Muhammadu Buhari and their paid media and criminal agents have intensified their efforts in launching a massive media onslaught against the Indigenous People of Biafra(IPOB) led by the ever indomitable Mazi Nnamdi Kanu. 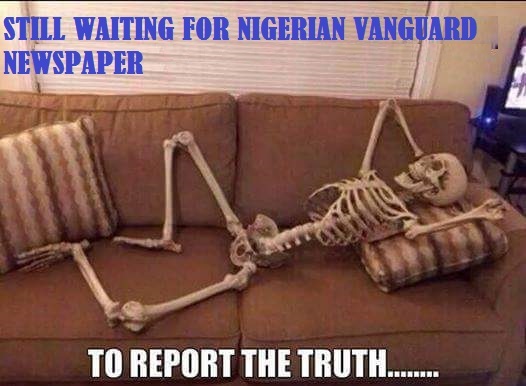 Family Writers' intelligence department has revealed that the Nigerian government has spent millions of dollars in buying over notable media houses in the country(the latest being Vanguard News publishers) to increase their already ignited efforts in disseminating false information against the leadership and cohesional structure of IPOB, as well as a relentless character assassination campaign against the personality of IPOB leader, Mazi Nnamdi Kanu whom the federal government are yet to find veritable evidences to justify the treason charges leveled against him. In conjunction with the bought over brown envelop media outlets in the country such as Vanguard, Sahara Reporters, Punch, The Nation etc, are some criminal elements from Ohaneze-Ndi-Igbo and other cult groups loyal to Ralph Uwazurike, a renowned compromised saboteur of Biafra restoration project. The source disclosed that this evil alliance orchestrated by Buhari's government is as a result of their paranoia towards the growing international support, awareness and attention being garnered by the Nnamdi Kanu led Indigenous People of Biafra. This has been revealed to be responsible for the springing forth of multiple groups such as TRIPOB, RE-TRIPOB, RE-IPOB and others who have flooded the front pages of Nigerian Newspapers and TV stations, claiming to be break-away factions of IPOB. "As it stands now, the Nigerian government is extremely confused and clueless on how to stop the increasing popularity of IPOB and Nnamdi Kanu. The extent which IPOB led by Nnamdi Kanu have taken Biafra agitation internationally is becoming a nightmare, tormenting Buhari and his cabinet members, hence the need to ignite a devastating media onslaught against them and tarnish their image both locally and internationally." the intelligence report stated. "In doing so, many media houses in the country and beyond have since been bought over, coupled with the alliance with Ralph Uwazurike and his loyalists, including a good number of them from Ohaneze youth wing and elders who are APC loyalists. "They are responsible for all the fake splinter groups such as TRIPOB, RE- IPOB and many others which are yet to emerge claiming to be a splinter faction of IPOB, just as it is being done against Niger Delta Avengers using the so called Cynthia Whyte led RNDA. "Each of these kangaroo groups that will emerge are expected to come up with different versions of invented propaganda that will be poised at dragging the name of IPOB and Nnamdi Kanu to the mud, the standing media henchmen will then disseminate the false information to the public without any investigation or consultation with the real IPOB making it to appear that there is a severe in-house fighting within the ranks of the group," the source concluded. Meanwhile reacting to a report by Vanguard News publishers concerning the emergence of different IPOB splinter groups known as TRIPOB and RE-IPOB, there was an Electronic Press briefing aired live on Radio Biafra, which was carried out by all the Principal Officers in all regions of Biafra land on Sunday night August 28. The Press conference which had in attendance the Coordinators and Women Leaders from Port-Harcourt Rivers state(IGWEOCHA), Abia state, Delta, Imo, Bayelsa, Anambra, Cross River, Ebonyi, Akwa-Ibom and Enugu states respectively, and others; was solely aimed at alerting the world that there is no such thing like division or instability within the leadership structure of the Indigenous People of Biafra(IPOB). They however made it clear that any criminal or cult group that claims to have been once affiliated to IPOB is a mere fictitious imagination and creation of the Nigerian government steered by President Muhammadu Buhari, whom they mocked of having run out of ideas on how to stop the imminent restoration of Biafra.